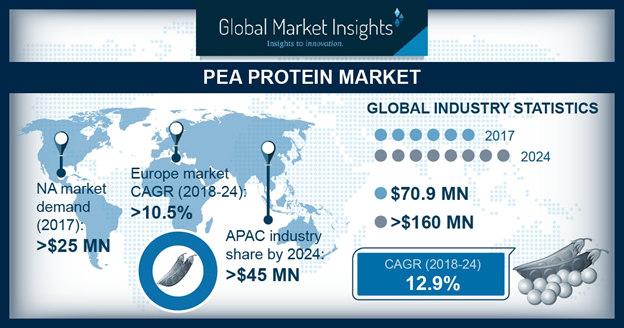 Pea Protein Market size is set to surpass USD 160 million by 2024; according to a new research report by Global Market Insights, Inc.
Germany pea protein market demand from sports supplement applications should register gains of over 11% by 2024. These products consist of branched-chain amino acids that are essential for decreasing muscle breakdown after workouts. They serve as a rich protein source for vegetarians, vegans, have a similar amino acid profile to animal products and improved assimilability as compared to other plant products. These products promote muscle repair, balance blood sugar which can aid in healthy weight loss and ensure the production of immune cells and neurotransmitters which should further promote pea protein market growth.